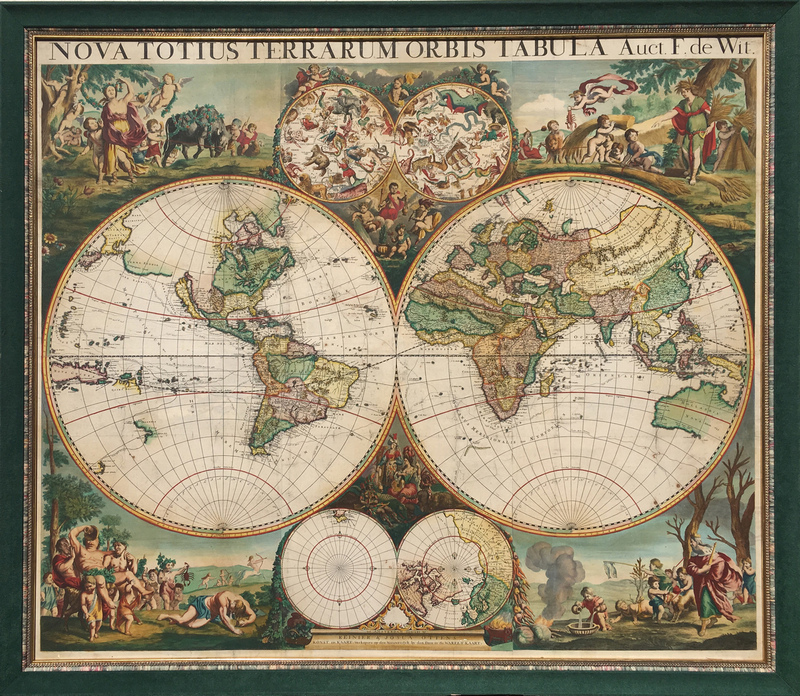 This is a very rare and lovely six sheet wall map of the world by Frederick de Wit that was originally published in 1680 and then re-issued by Reinier & Josua Ottens circa 1720. The large corner vignettes are precise copies of those featured in de Wit’s terrestrial map of 1670. These lovely, lively vignettes portray mythical scenes and one scene in which locals appear to be preparing fish to preserve by smoking. In addition to the corner vignettes are figures representing various peoples from around the world, and the four seasons and the elements. Positioned at the top between the main hemispheres are two smaller celestial circles which portray the constellations and signs of the zodiac, with the figures for each fleshed out and beautifully colored. Two smaller globes are positioned below the main hemispheres featuring north and south polar projections. Frederick de Wit (1629 -1706) was a mapmaker and map seller. He was born in Gouda but worked and died in Amsterdam. He moved to the city in 1648, where he opened a printing operation under the name of The Three Crabs, which he later changed to The White Chart. From the 1660s onward, he published atlases with a wide variety of maps. He is best known for these atlases and his Dutch town maps. After Frederick’s death in 1706 his wife Maria ran the shop for four years before selling it. Their son Franciscus was a stockfish merchant and had no interest in the map shop. At the auction to liquidate the de Wit stock, most of the plates went to Pieter Mortier, whose firm eventually became Covens & Mortier, one of the biggest cartography houses of the eighteenth century. Condition: The map has been dry-mounted to a backing board, with matting and a large frame available on request.